While many books examine specific wars, few study the history of war worldwide and from an evolutionary perspective. A Global History of War is one of the first works to focus not on the impact of war on civilizations, but rather on how civilizations impact the art and execution of war. 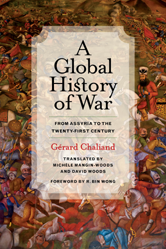 World-renowned scholar Girard Chaliand concentrates on the peoples and cultures who have determined how war is conducted and reveals the lasting historical consequences of combat, offering a unique picture of the major geopolitical and civilizational clashes that have rocked our common history and made us who we are today.